As you know or maybe not if you are a fresher then you should know that CorelDRAW is a crucial and effective graphics software tool for graphic designers. By using CorelDRAW you can create various vector graphics design for several live projects and real-time examples. By joining CorelDRAW training at multisoft systems you will discover and get to know the predefined standard methods and abilities that will experience an excellent learning in editing graphics with this technology. The CorelDraw software is designed for designing work for the work profile as graphic designers, fashion designers, textiles designers, print professionals, packaging firms, and aspiring designers. 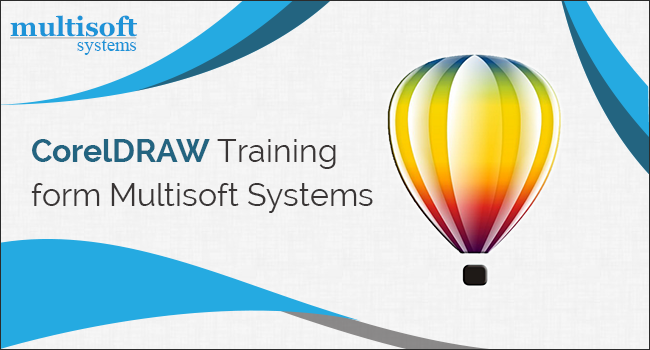 At Multisoft systems, we offer a full-fledged and best training in CorelDraw by the best professionals in the industry. Are you inquisitive to learn how to create vector graphics designs for several live projects with real-time examples? CorelDraw training in Multisoft systems provides updated information about technology and their use in a unique way along with the General details of CorelDraw with Hands-on live exercises experience. The Certificate Course in CorelDraw offers a wide range of features and tools for creating the most intricate illustrations, stationery designs, covers, packaging, books, and much more, that can help you to work with different design approaches. Who should go with CorelDraw? As per the above information, Corel DRAW is designing software tools have been used by various industries as well as freelancers. So there is no any restriction or requirement of joining the CorelDRAW training. Any educated person can join to add-on a skill in his curriculum. Introduction & uses of CorelDRAW training is also suitable for newcomers with fundamental experience of using compatible vector graphics software tool with the training of CorelDRAW at Multisoft systems. Joining Corel Draw training at Multisoft systems will definitely improve your knowledge of the tools and you will receive an experience of working on live projects. Corel Draw is vector based graphics tool which means the images designed with it are resolution independents & can be magnified to any size without any alteration in quality. It is developed and designed to satisfy the demands of today’s designer to create ads or collateral for print or for the web.